Case 42 mm, Black Ceramic. Dial Grey dial features 30-minute counter at 3 o'clock, 12-hour counter and date aperture at 6 o'clock, seconds sub-dial at 9 o'clock. Movement Automatic Swiss Made. 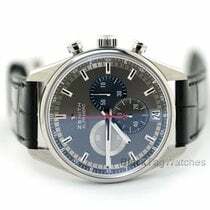 Zenith El Primero Caliber 400, 31 jewels, 326 parts, estimated power reserve 50 hours. Bracelet Ivory calfskin leather strap with double folding buckle. Extra Blue leather strap!